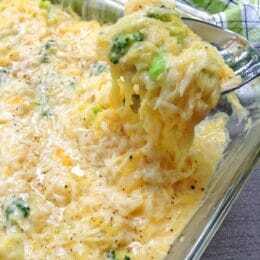 This cheesy, comforting Cheesy Spaghetti Squash Bake is packed with vitamins and minerals from three different veggies. 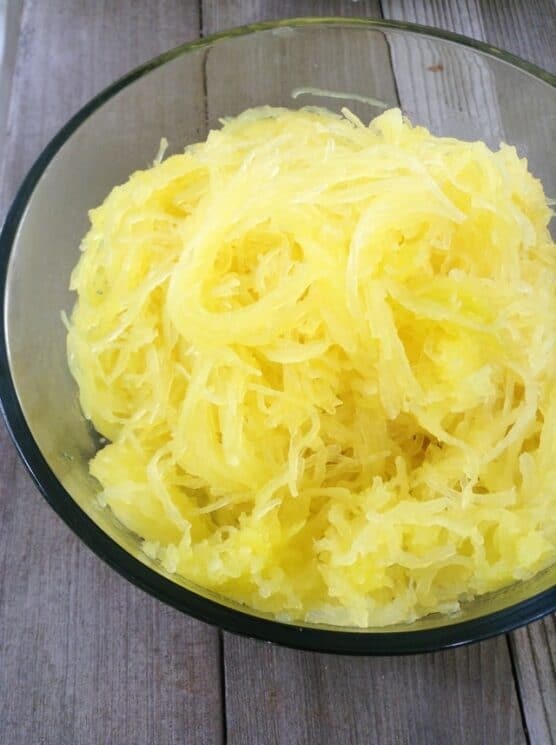 Check out our Ultimate Guide to Spaghetti Squash for tips on cutting and cooking spaghetti squash! I’ll never forget the first time I served my son spaghetti squash. He was three years old, and we were having an impromptu picnic in the grass. We shared a thermos full of the noodle-y strands topped with homemade beef bolognese, and he scarfed it down happily. At the time I was surprised he took to this new food. But in retrospect, it makes a lot of sense. 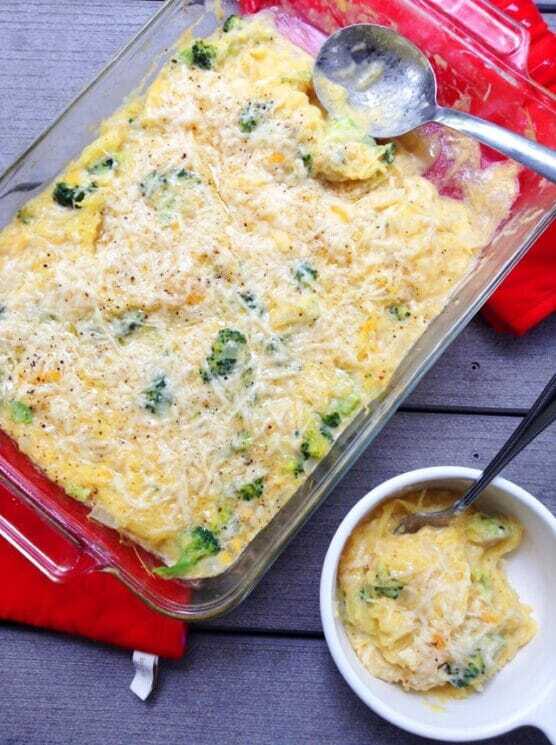 Spaghetti squash is as close to pasta as you can possibly get with a fresh vegetable. This alone should make parents of picky eaters clamoring to get their hands on one! The mild-flavored, carbohydrate-rich veggie also packs in great nutrition. Kids and grownups get plenty of fiber, vitamins, and antioxidants from this fun, familiar-shaped vegetable. 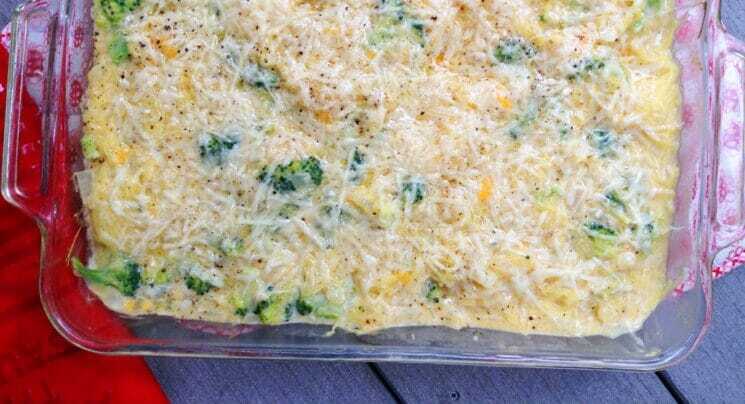 This Cheesy Spaghetti Squash Bake combines some of my favorite things: fresh vegetables (including broccoli–suprise! 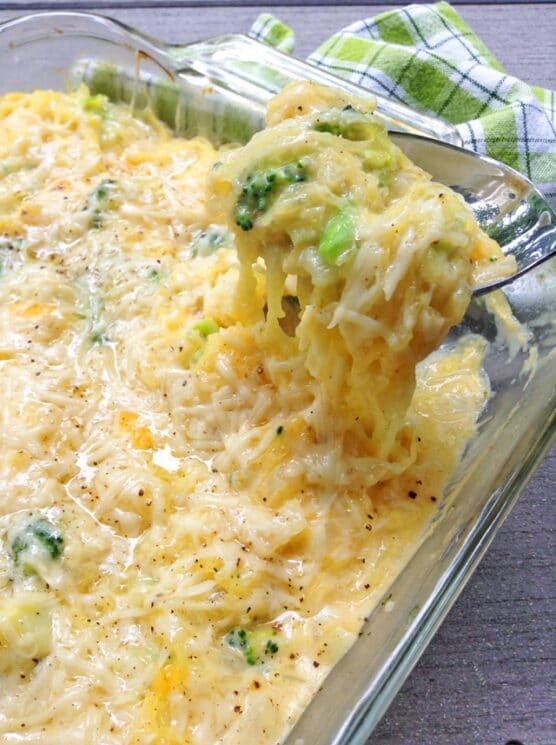 ), creamy cheese sauce, and make-ahead convenience. Kids love it because it’s energy-dense and delicious. So do I! It also makes a lot of food, so it’s perfect if you need to feed a crowd. Or enjoy the leftovers yourself. Pair this casserole with grilled chicken, fish, or hard-boiled eggs for protein, and a side of fresh fruit, for a super tasty, balanced meal. The keystone ingredient in this recipe is well-prepared spaghetti squash, and this is the part that you can do up to two days in advance and refrigerate. 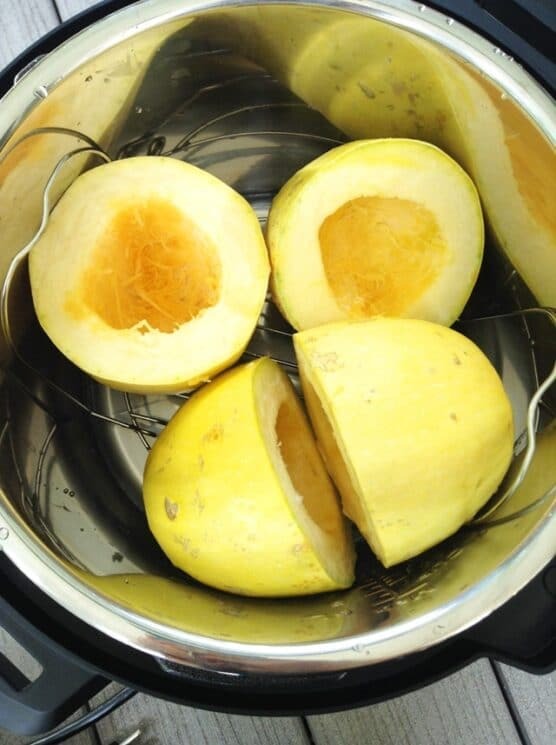 If you don’t have an Instant Pot, or you’d rather cook your squashes the old-fashioned way, you can roast them at 400 degrees for about 30 minutes. 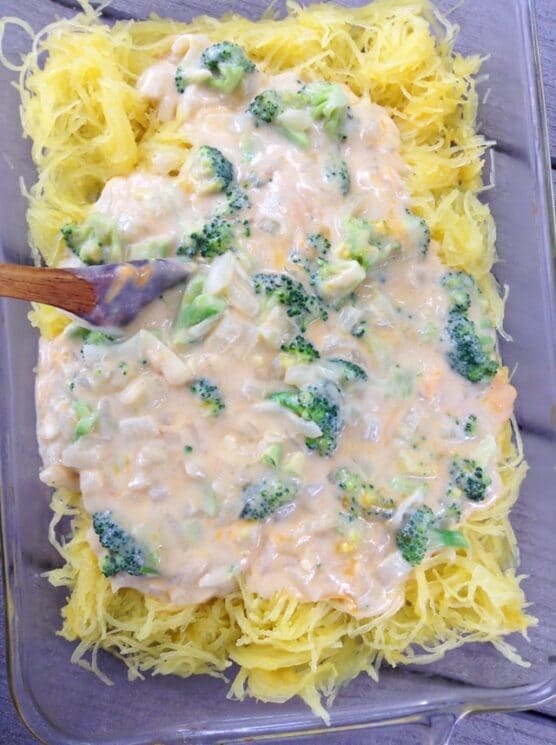 Once your squash is cooked and you’ve pulled out the strands, set them aside while you prepare the cream sauce. The next part is easy! Saute your garlic, onions, and broccoli in a large pan, then add the flour and broth and heat it until it thickens. 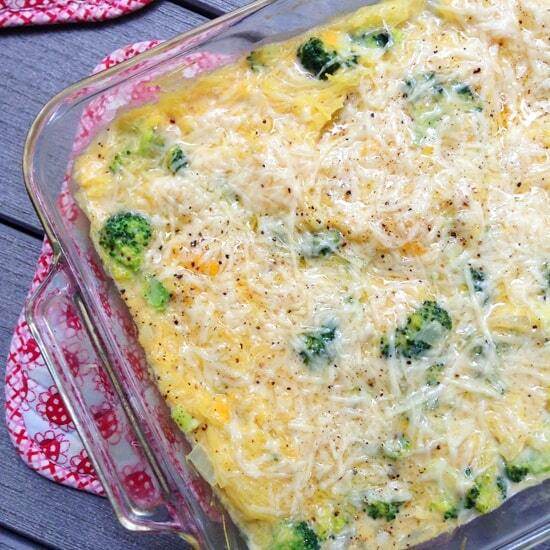 Add a sprinkle of cheese and then bake until bubbly. Enjoy this healthy, tasty, and nourishing dish with your family! Chop broccoli and onion. Mince garlic. Roast squash or cook in the InstantPot. Once cooked, scoop the strands of squash with a fork and place in a baking dish. Heat oil in a saucepan over medium heat. Add onions and garlic and cook about 2 minutes. Add chopped broccoli and cook until al dente. Stir in flour. Reduce heat to low and cook, stirring continually 3 – 4 minutes. Add milk and vegetable broth and continue whisking, raising heat to medium-high until it comes to a boil and becomes smooth and thick, about 2 minutes stirring; season with salt and pepper. Once it becomes thick, remove from heat, add cheddar cheese and mix well until cheese is melted. Pour mixture into the baking dish with the cooked spaghetti squash. Sprinkle Parmesan cheese on top. Bake for 25 to 30 minutes until golden. OMG, looks so good! I’ll have to try this one. Thanks. Have you tried this by microwaving with the deep covered baker? I am going to experiment this weekend , I think this recipe could be a huge time saver and done in less the 30 minutes in the deep covered baker using the microwave! I haven’t tried it, but that is a great idea!! Is that a Pampered Chef Deep Covered Baker? That baker is DaBomb! Going to try your recipe it looks so good! Hi, I like your recipes a lot. but a few times I tried to print, the printing button didn’t work. just want to let you know. Thanks so much Christine- it looks like it worked in chrome, but not other browsers. We’re trying to fix it now! Hi Amy, the 1/4 cup flour used in this recipe, is it wheat flour or all purpose flour? What size baking dish do you use? Also, what would you recommend serving this with? Thanks! This looks so yummy. I can’t wait to give it a try:). But can I replace broccoli by another vegetable? The recipe once done is good but it’s a little bland. I added ground turkey cooked with Italian spices and it really helped. I gave this recipe 2 stars because I felt the I structions were woefully inadequate specifically in step 3. Not sure how long this was supposed to take but it took me an hour and a half. Any thoughts on what to substitute for the cheese? We are trying to eat whole food plant based and while we love cheese… trying to cut it out. Thoughts? 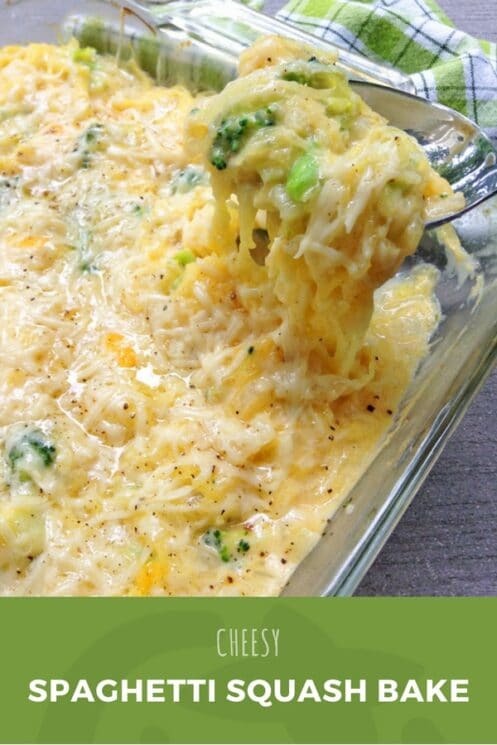 I’m thinking of making this with vegan cheese sauce (and topped with bread crumbs) rather than shredded cheese – it’s made with carrots and potatoes, and is super easy! I liked it! As did my husband. My squash hating 3 year old would not touch it. Has anyone tried this with a nondairy option? Hi, looks delicious…. what is the serving size for 31g carbs? My son is type 1 diabetic and takes insulin based off of the carb count for 1 serving size. I want to leave a comment in case an amateur like myself comes across this. I did wait until after my hangry tears passed to comment. I did make this tonight. It took me over an hour. And my kids all chose my advice of if you hate it say I love you mom. Thank you for cooking. And making their own meal. For an amateur cook here is my feedback. For use the microwave to soften the squash please clarify. After 30 minutes I had to Google cook time. It was 10 minutes to get soft enough to shred. Also “roast the broccoli and squash” is not clear for me. I even asked hubs how to do this and the teen kids who help cook. And we did not know. My daughter helped with the milk flour segment for 20 minutes and it never thickened. And the ingredients said vegetable stock and instructions say chicken stock. My meal turned out ok. With an inch pool of liquid in the pan. I never leave feedback. This was the most difficult meal for me by far. But I see this site wants to encourage healthier meals for our kids. So I waited to respond so it can be written for even the novice able to prepare healthier meals. Made this tonight for my vegetarian daughter and will definitely be making it again for the whole family! I cut the recipie in 1/2 worked out great and sprinkled Italian/parmesan bread crumbs on top. I haven’t tried it, but let us know if you do! what about shredding the squash raw with a vegetti spiralizer? why cook it first when it’s going to be baked anyway? It might be kind of tough, but worth a try! Sounds delicious! How did it turn out?